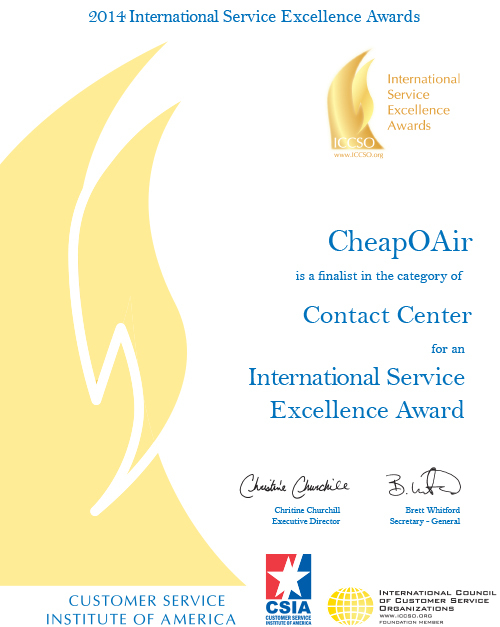 November 25, 2014 — CheapOair, a leading hybrid (online/traditional) travel agency, announced today that it was recognized with top industry honors for its website. 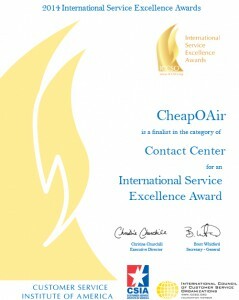 CheapOair’s website was named “Best in Class” winner in the Travel/Tourism category in Interactive Media Awards. Out of 224 entries in the Travel/Tourism category, only 7 were selected as Best in Class winners. CheapOair’s website scored the win with a high, overall score of 481 out of 500. Created by the Interactive Media Council (IMC), a nonprofit organization of leading web designers, developers, programmers, advertisers and other web-related professionals, Interactive Media Awards recognize the highest standards of excellence in website design and development. CheapOair is the first hybrid (online/traditional) travel agency that enables consumers to book travel online, on mobile apps, by phone or live chat. CheapOair (http://www.cheapoair.com, 1-800-556-2345) bridges the gap between an online and traditional travel agency with certified travel agents available 24/7 to help find deals and offers to destinations worldwide on over 450 airlines, 150,000 hotels, and 100s of car rentals. Partner airlines benefit from access to CheapOair’s broad customer base that books high yield international travel and add-on ancillaries at above the industry average. Follow CheapOair on Facebook and Twitter to learn how to travel the world for less. November 24, 2014 — CheapOair, a leading hybrid (online/traditional) travel agency, announced today that it was recognized with two top industry honors for its mobile app and mobile website. CheapOair mobile app and mobile website were named as Gold winners in two categories – Mobile App of the Year and Mobile Website of the Year – in MarCom Awards. Only 23% of this year’s entrants were recognized with the Gold award. Since launch, the CheapOair app has been downloaded a total of over 3 million times and is downloaded an average of 4,500 times a day. With the app, consumers can – a first in the industry – book ancillaries, such as baggage, premium seats, priority boarding, and even choose their exact seats. The app has been rated 4 or 5 stars by more than 80% of users and was named to the Top 10 Travel Apps of the Year list by App Annie (in the U.S. and 78 other countries). Organized by the Global Association of Marketing and Communication Professionals, MarCom Awards is an international creative competition that recognizes outstanding achievement by marketing and communication professionals. More than 6,500 entries were received this year, from U.S., Canada and 15 other countries, with winners ranging from start-ups to Fortune 500 companies. Out of 224 entries in the Travel/Tourism category, only 7 were selected as Best in Class winners, with additional 4 receiving Outstanding Achievement mentions. CheapOair website scored the win with a high, overall score of 481 out of 500. Marking our website’s first award, this is an exciting start to hopefully many more. Congratulations to our entire development, design and online teams! We’re excited to announce that our mobile app and mobile website were named as Gold winners in two categories – Mobile App of the Year and Mobile Website of the Year – in MarCom Awards. Organized by the Global Association of Marketing and Communication Professionals, MarCom Awardsis an international creative competition that recognizes outstanding achievement by marketing and communication professionals. More than 6,500 entries were received this year, from U.S., Canada and 15 other countries, with winners ranging from start-ups to Fortune 500 companies. Both our entries won Gold awards, with only 23% of entrants recognized with the Gold award. While this is of course not the first recognition for our Top 10 app, it is the first accolade for our mobile website – a very exciting achievement that showcases our engineering, design and marketing teams’ excellent work and that will hopefully be only the first of many future recognitions. Congratulations to our mobile app and website teams! November 20, 2014 — CheapOair, the first flights-focused hybrid travel agency, today announced its top ten most popular domestic and international destinations for Thanksgiving. Los Angeles, Orlando and Denver once again dominated this year’s top three domestic spots, however the most popular international destinations list highlights Cancun as the most flocked-to destination this year, followed by Manila and San Juan. This year, the top destinations remain the same when compared to 2013, showing, for the majority, only slight increases in average airfare. 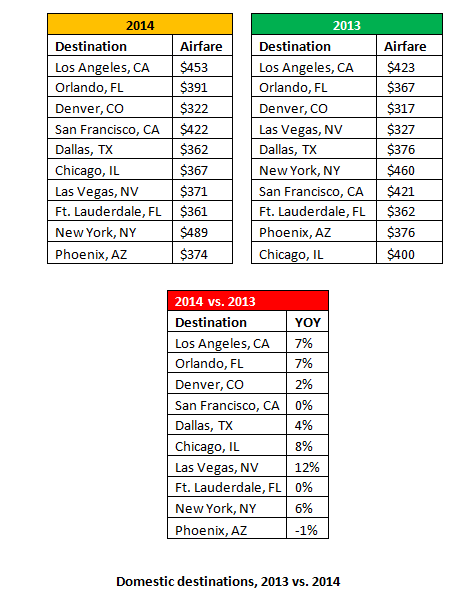 In addition to the top three cities upholding their positions this year, San Francisco, CA and Chicago, IL made a jump to the top six destinations, which moved Las Vegas, NV to the number seven spot. 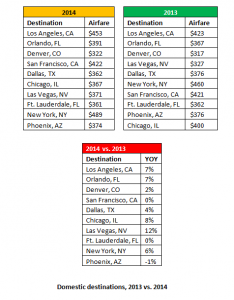 The average roundtrip airfare of 2014 is approximately $392, and travelers seeking the best value can find the lowest fares to Orlando, Denver, Dallas, Chicago, Las Vegas, Ft. Lauderdale and Phoenix, as they are all priced below average. 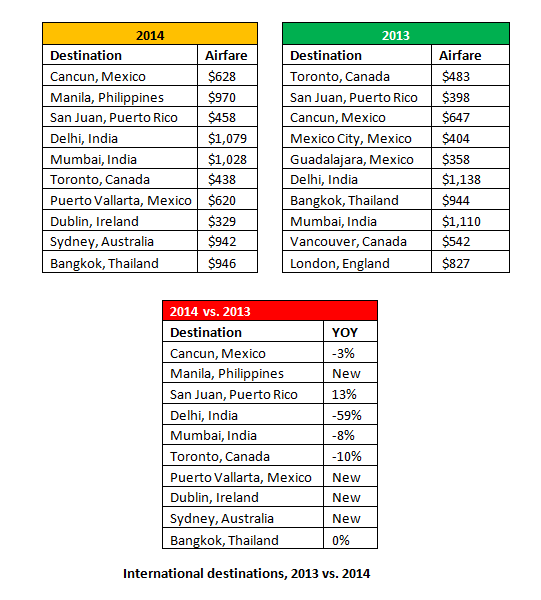 This year’s data for international travel yielded four new destinations; Manila, Puerto Vallarta, Dublin and Sydney, replacing Mexico City, Guadalajara, Vancouver and London from 2013. This year, airfare prices are varied, showing a combination of both decreases and increases across the board. With a slight cost decline this year for Cancun, the destination moved to the number one spot, as opposed to being number three in 2013. However, the opposite occurred for Toronto, whose cost also declined from 2013 but now holds the sixth spot, versus the first. By consistently monitoring travel trends, CheapOair’s mission is to educate and aid consumers and travel professionals in both planning their travel accommodations and staying current on the most popular destinations. With a portfolio of products, including partnerships with 450 global airlines, CheapOair’s inventory is guaranteed to find the highest quality, cost efficient, reservations in the industry. The fares referenced are averages, calculated based on bookings made 30+ days in advance, leaving anytime Friday before Thanksgiving and returning Sunday or Monday following the holiday. With that in mind, the average fare to the top 10 destinations is $391.00. With 90% confidence, CheapOair predicts that the fares can fluctuate +/- $160, based on tickets purchased prior to Nov 6, 2014. For more information, please visit http://www.CheapOair.com, http://www.cheapoair.com/mobile, or on our social media pages, http://www.Facebook.com/CheapOair and https://twitter.com/cheapoair. November 04, 2014 — Travelong, a Fareportal company, announced today that it received an outstanding sales performance award from SriLankan Airlines, the national carrier of Sri Lanka. This marks the second consecutive recognition of Fareportal and its companies by the airline. “Congratulations to Travelong on receiving the Silver Award for USA, We value our partnership and thank the Travelong team for their remarkable sales achievement for SriLankan Airlines in 2013/2014,” said Dillan Ariyawansa, head of SriLankan Airlines North America. The award was presented during the 2014 Agent Awards ceremony at the Permanent Mission of Sri Lanka to the United Nations in New York on October 9, 2014, by Nishantha Wickremasinghe, chairman of SriLankan Airlines, Dillan Ariyawansa, head of SriLankan Airlines North America and Ajith De Alwis, operations manager of SriLankan Airlines USA. According to Wickremasinghe, tourist arrivals in Sri Lanka have reached an all-time high since 2012, with double digit growth expected in 2014. Similarly, Travelong bookings to Sri Lanka have continued to increase every year, with frequent promotions encouraging customers to take advantage of Travelong’s flight-focused search engine, cheapest fares and fastest booking path in the industry to find affordable travel deals to one of the world’s most exciting destinations, Sri Lanka. SriLankan Airlines, the national carrier for Sri Lanka and the newest member of the oneworld alliance, is an award-winning airline with a firm reputation as a global leader in service, comfort, safety, reliability, and punctuality. Awards include World’s Friendliest Cabin Staff by Skytrax, Best Airline in South Asia from Travel Trade Gazette, World’s Most Reliable Operator of Airbus A330s and A340s by Airbus Industrie, and the Etihad Global Excellence Award for Best Regional Caterer. Launched in 1979, the airline’s hubs are located at Bandaranaike International Airport in Colombo and Mattala Rajapaksa International Airport, Hambantota providing convenient connections to its global network (including codeshare partners) of 89 destinations in 44 countries around the world. SriLankan has mutual code share services with Etihad Airways, Malaysia Airlines, Air Canada, Alitalia, Oman Air, Siberian Airlines, Finnair, Asiana Airlines and Mihin Lanka. SriLankan Airlines joined the oneworld airline alliance on May 1, 2014 this year as the first carrier from the Indian Sub-continent. SriLankan now flies alongside some of the biggest and premier brands in the airline business – airberlin, American Airlines, British Airways, Cathay Pacific, Finnair, Iberia, Japan Airlines, LAN, Malaysia Airlines, Qantas, Royal Jordanian and S7 airlines. Together with its oneworld membership, the flagship carrier of Sri Lanka offers its customers convenient connections to a thousand destinations in over 150 countries, opportunities to earn and redeem frequent flyer miles any oneworld carrier and access to over 500 lounges for top tier frequent flyers. Fareportal is a travel technology company that powers hybrid (online/traditional) travel agencies. Utilizing its innovative technology and company owned and operated contact centers, Fareportal has forged strong industry partnerships with over 450 airlines, 150,000 hotels and 100s of car rental companies to serve millions of customers every year. With a portfolio of consumer travel brands including CheapOair and OneTravel, Fareportal’s airline partners benefit from access to a broad customer base that books high-yield international travel and add-on ancillaries at a rate higher than the industry average. 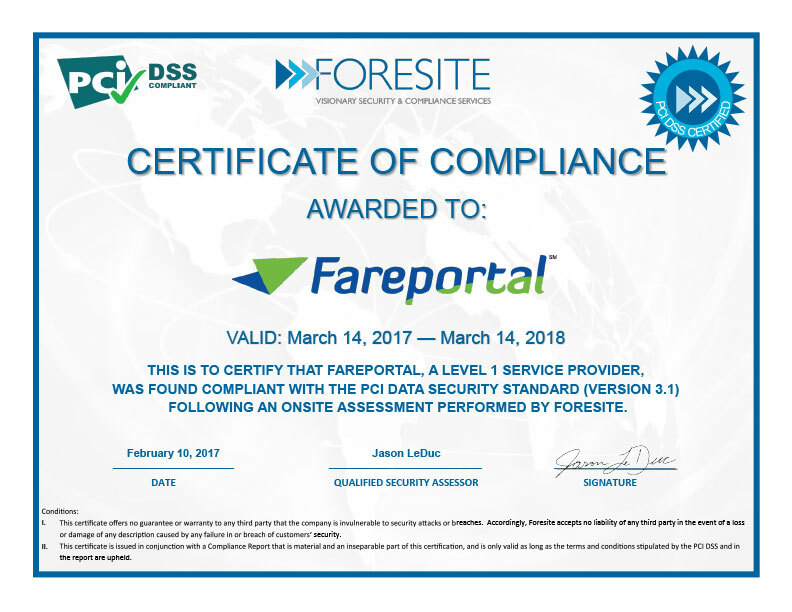 To learn more, visit http://www.fareportal.com.